A minimum of several hundred thousand people with individual health insurance policies (those not provided by their employers) have received letters notifying them that their coverage will be terminated on Jan. 1 — or at some date after that — because their plans don’t meet the requirements of the Affordable Care Act. The issue has been percolating for several weeks, initially being overshadowed by the rocky rollout of the Healthcare.gov federal health insurance marketplace. But this week, in part because of a prominent NBC News report, the issue has gained traction. Republican lawmakers and the act’s opponents have given it more attention than the website’s continuing woes. The story is full of nuance, and that’s what makes it easy to misunderstand. Four sources deeply involved in the Affordable Care Act tell NBC News that 50 to 75 percent of the 14 million consumers who buy their insurance individually can expect to receive a "cancellation" letter or the equivalent over the next year because their existing policies don’t meet the standards mandated by the new health care law. One expert predicts that number could reach as high as 80 percent. It’s hard to put an exact number on this, given that insurance plans are the ones who decide whether or not to continue offering an insurance product. Experts have estimated that somewhere between half and three-quarters of those who currently buy their own policies will not have the option to renew coverage, which works out to around 7 to 12 million people. Even when we do know a firm number, a more fundamental question is: Are these cancellations in consumers’ best interests? In short, there are winners and there are losers — just as there have been in many other areas of the Affordable Care Act (more on that in a subsequent post). Some of the people being terminated form their plans will end up paying more for new coverage; some will pay less. Some will qualify for government subsidies to lower the cost of their insurance even further, and some won’t. In many if not all cases, they will receive a richer set of benefits. But many consumers may not have wanted them — or needed them (maternity care, for example). Equally clear is that the new marketplace taking shape will not allow insurance companies to discriminate based on individuals’ pre-existing conditions; nor can insurers charge older people far higher rates than the young. And just because somebody receives a cancellation notice and believes his or her insurance costs will go up doesn’t mean that’s right. Michael Hiltzik at the Los Angeles Times has done a good piece raising questions about the veracity of some of the stories being reported. It’s easy to see this issue through a partisan lens, and that is happening. But then there are cases like Paul Levy’s. Last weekend, he wrote a post on his blog (“Didn’t they promise lower costs?”) about being dropped by his insurance company and being forced to spend considerably more money for insurance. 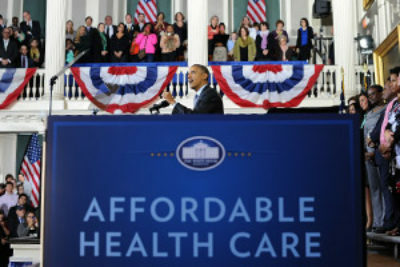 He had purchased his policy after March 2010, so he wasn’t somebody covered by the president’s “keep your plan” pledge. A professor of management and operations at Northwestern University’s Kellogg School of Management followed up with Levy and suggested a different plan that could save him some money. But Levy still concluded he’ll be in worse shape than he is now. 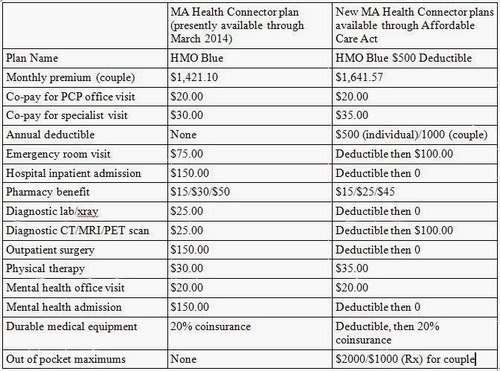 Here’s a graphic he made comparing his current plan with the plan he will purchase. While Levy sees value in the act’s goals, he wrote Tuesday that he wishes the administration was more forthright about what is actually happening and less defensive — for instance, parsing the words of the president’s pledge. I have been listening to actuaries for many months who made it clear that the new plans would have to be more expensive to cover the law’s guaranteed issue and other insurance requirements. Those requirements are extremely desirable in providing insurability and financial security to millions of Americans and are, in fact, key attributes of the ACA. If the costs and benefits of these requirements had been addressed honestly by the administration, perhaps it would not feel the need to parse the President’s promise as finely as his spokesperson did today.